Ah, conflict. What would we do without it? What do we do WITH it? In stories, the conflict – the interplay between people, the striving for what we think are opposite sides – is what keep us interested. In real life, some would say the same – while others would say, “if you give me conflict – get me out of there!” People have many reasons for avoiding conflict – perhaps they value the relationship over whatever the “fight” is about; perhaps they don’t want the discomfort of conflict; perhaps they feel it is too risky. At Global Genesis, we believe that conflict is not only a natural part of the human dynamic, but that conflict can be an opportunity to build relationship as well as get results. We help people get better at conflict ultimately so they can achieve better outcomes, better relationship – and even common ground. Our image for conflict is the volcano. For those of us who have had the opportunity to see a volcano, there is nothing like stepping onto sharp, raw new earth – literally glowing underneath from the efforts of being made. Creating common ground in conflict has its similarities – conflict can truly be an opportunity to forge new territory together, to open up the opportunities for new innovation and creativity. However, it takes personal will to take the pressure of conflict and harness it to create that common ground. Principles for Effective Conflict. We have probably all seen conflict “blow” – and the detritus from that explosion impacting not only the parties involved, but sometimes innocent bystanders. Less often, we see individuals work through conflict effectively. Below are principles for conflict that we have taught in over 60 countries. Principle 1: Turn “tension” into “in-tension”. Consider – what is the most critical moment in a conflict? You are preparing to talk to that someone who “does that thing” that really MUST change. You find a time to sit down with them… and you proceed to tell them exactly they MUST change. Backup- rewind – you missed it! The most critical moment is even before you begin. If you really want for your conflict to be resolved, if you want to use it as an opportunity to build relationship, you must set your intention from the beginning to look for a win for both of you. In fact, your intention must be that you will work as hard to create a win for them as you do to create a win for yourself. 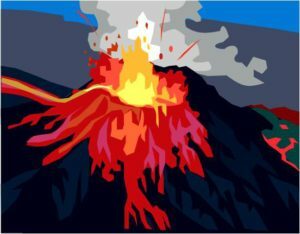 Your intention then becomes a tool of transformation – and is ultimately the decision to “enter the volcano” of conflict. Principle 2: Start with Acceptance. 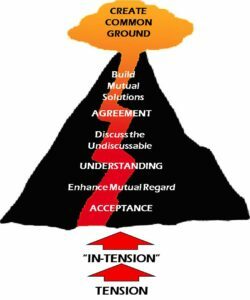 Once you have decided to “enter the volcano”, it is important to start with accepting both sides of the dispute. This is NOT about agreeing – it is rather about hearing what each party has to say. It is the opportunity to hear the first level of stories, opinions, and ideas that brought each party “to the table.” What you are really doing when focusing on acceptance is enhancing mutual regard. The key is to help the other party know that they have been heard – and also ensure that you feel the other party has heard you. This builds respect between parties, the foundation for future progress. Principle 3: Build Understanding. The next step is to create deeper understanding between both parties. Now that you know what, the question is why do they believe the way they do? What is the motive for their action? What stories are underpinning the events to date? it is only when you have understanding that you can create solutions that will really work in the long-term. The classic Getting to Yes tells the story of two sisters who fought over an orange. They achieved a compromise – to split the orange, at which point the first took her half off to zest it for a cake, leaving the pulp unused, while the other took hers off to juice, leaving the zest untouched. By missing the motive of each sister (and settling for compromise, as opposed to resolution), both sisters lost out on a win-win solution. Ultimately, by focusing on building understanding, you create trust together, which will help build a safe container for “discussing the undiscussables” – those things that are hard to discuss, but may hold the key to a solution that will be a true win for both parties. Principle 4: Craft agreements It is only AFTER focusing on acceptance and understanding that agreements can begin to take shape. Why? In our work, we have observed again and again that trust only comes after respect is built, and it is only with both respect and trust in play that solid agreements that last over time can be created. The second and third principles help build both trust and respect. If solutions are offered before those other principles have been explored, most times they will either a.) not last because they don’t solve the real problem, b.) will be shunned immediately because the trust hasn’t been built to the point where the offer is trusted, or c.) that problem is solved, but the conflict continues and arises in a different form at another time. Lets say that you have moved through all of the principles, and are crafting an agreement. Try to diverge first – open up different solutions and play with different scenarios, without making a decision. After you have put your options on the table, that’s when you can converge on a solution. This allows you to be creative in not only the facts of the solution, but also the form of the solution. More about conflict: Ultimately this rests on your ability to manage your own emotions internally – where much of the pressure of conflict really stems from. See Terry’s blog here for his description of Global Genesis tools for working with the emotions of conflict. Further, each principle has a set of skills that you can employ to put these principles into action – we will explore those in another blog post.